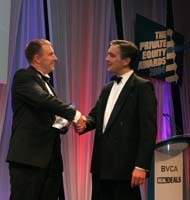 Once again, Shield has underlined its commitment to the industry with its sponsorship of The Private Equity Awards - a major event in the British Venture Capital Association calendar. This annual event - held in conjunction with Real Deals magazine - marks the very best achievements of individuals and firms working within the private equity industry. The awards are the ultimate accolade for the industry's dealmakers and advisers. At Shield, we regularly find ourselves acting for private equity houses on exits, or working with private equity teams on the buy side, and we gratefully acknowledge private equity's role in sustaining the M&A market in recent years. It therefore seemed natural for us to become one of the sponsors of this prestigious event, having done likewise with its EVCA cousin in Paris last year. Our fellow sponsors include Aon, Deloitte, and the Bank of Scotland.